My husband and I recently went on a couple’s getaway to Los Angeles. I had scoped out a few restaurants in advance and the one that stood out to me most was the historic Musso & Frank Grill, the oldest restaurant in Hollywood. It first opened it’s doors in 1919 and has been referred to as “the genesis of Hollywood.” Dining at The Musso & Frank Grill was one of the highlights of our trip and is among the most unique and fascinating restaurants we have visited. Let me take you on a virtual tour of the restaurant that has been listed in the book 1000 Places to See Before You Die. 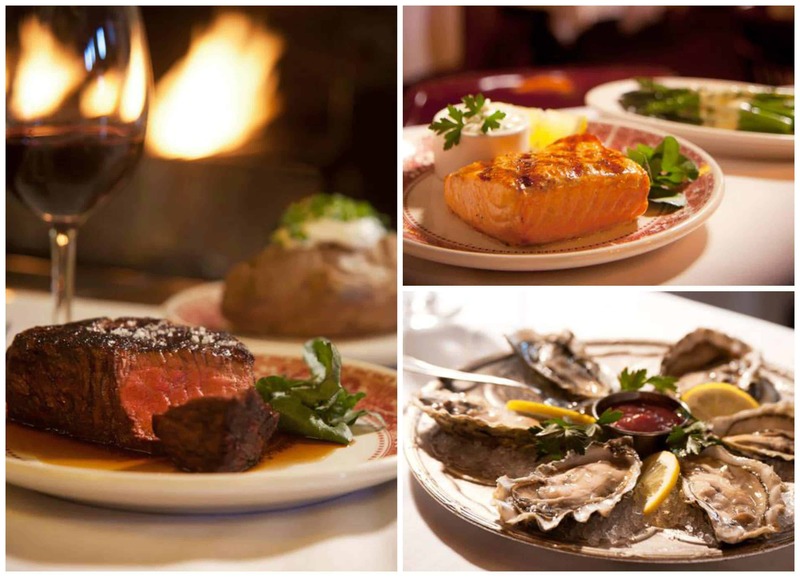 Musso & Frank Grill was opened in 1919 by entrepreneur Frank Toulet, Oregon restaurateur Joseph Musso, and brilliant French chef Jean Rue and it quickly became known for its excellence, both in food and service. “By the 1930s Musso and Frank was firmly established at the center of Hollywood’s cultural life” (Wikipedia). 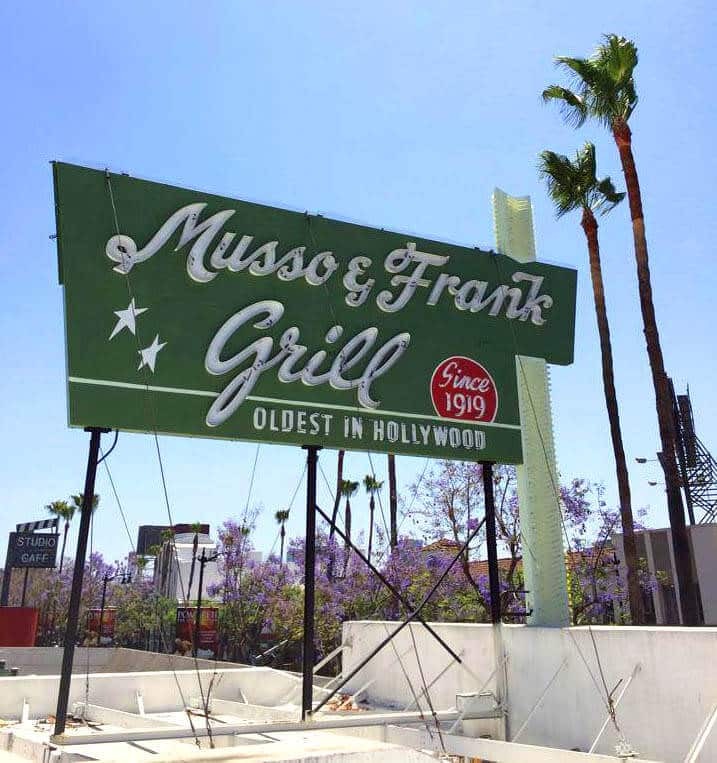 Originally named “Francois” in 1919, it was later changed to Musso & Frank Grill in 1923. Check out these neat photographic timelines of it’s beginnings in 1919 through the 60’s. Frequented by movie stars, directors and producers for generations, it was also the regular hangout of some of America’s most revered writers, including William Faulkner, Dashiell Hammett, Ernest Hemingway, Erskine Caldwell, John Steinbeck, William Saroyan, Dorothy Parker, and F. Scott Fitzgerald. In the early days after prohibition there was what was called the Back Room in the restaurant, a legendary room reserved for the Hollywood elite, where these writers would come to drink, work, and mingle. 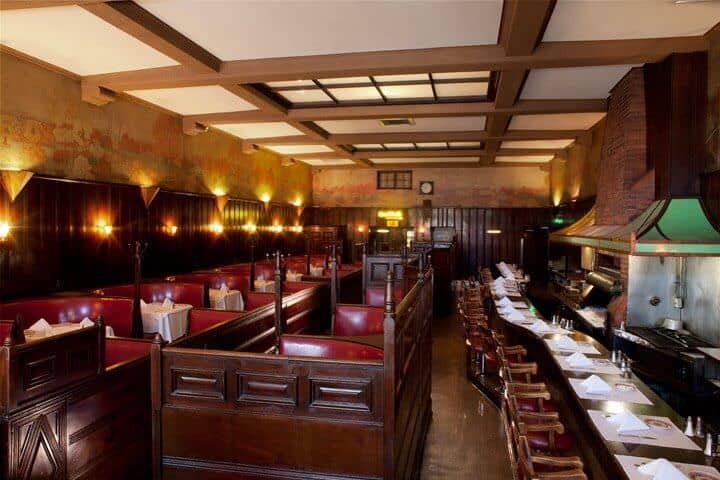 The Los Angeles Times once wrote that if you stood in Musso & Frank’s Back Room long enough you, “…would have seen every living writer you had ever heard of, and some you would not know until later.” Contemporary writers inspired by the old masters continue the tradition of making Musso & Frank their home. Musso & Frank was also a favorite among many of the old Hollywood stars such as Charlie Chaplin, Greta Garbo, Humphrey Bogart, Elizabeth Taylor, Lucille Ball, Gary Cooper, Rudolph Valentino, Bette Davis, Jimmy Stewart, Steve McQueen, Charleton Heston, Frank Sinatra, and Marilyn Monroe, to name a few. An interesting little fact, The Musso & Frank Grill is mentioned in Raymond Chandler’s book, The Big Sleep, several chapters of which were written in the Back Room, and the book was made into the classic movie starring Humphrey Bogart. Musso & Frank continues to be a favorite among many of the current stars, including such regulars as George Clooney, Brad Pitt, John Travolta, Tim Robbins, Julia Roberts, Johnny Depp, and Harrison Ford. The big room on the right side of the restaurant used to be a storage room and was converted in 1955. It’s still called “the New Room.” It has the original bar, fixtures and furniture that were in the Back Room. 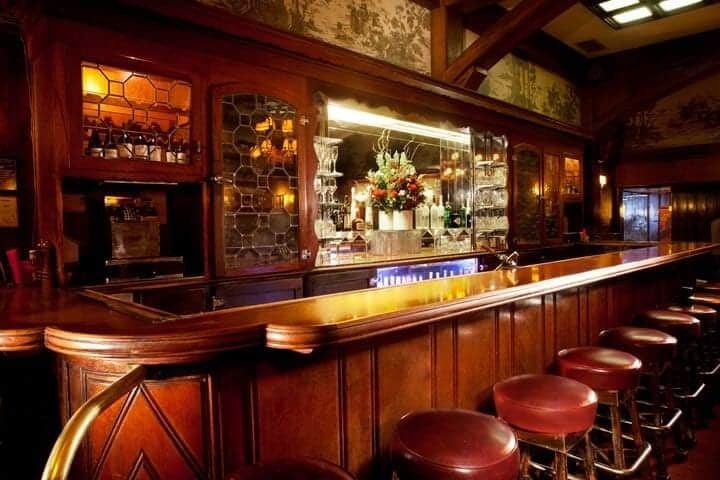 The bar at Musso & Frank has been named one of the “Best Bars in America” by Esquire and Forbes Magazine wrote: “The best martinis in LA, or maybe anywhere.” Musso’s martini was also voted Best in America by GQ. The staff has more than 90 years of collective bartending experience. 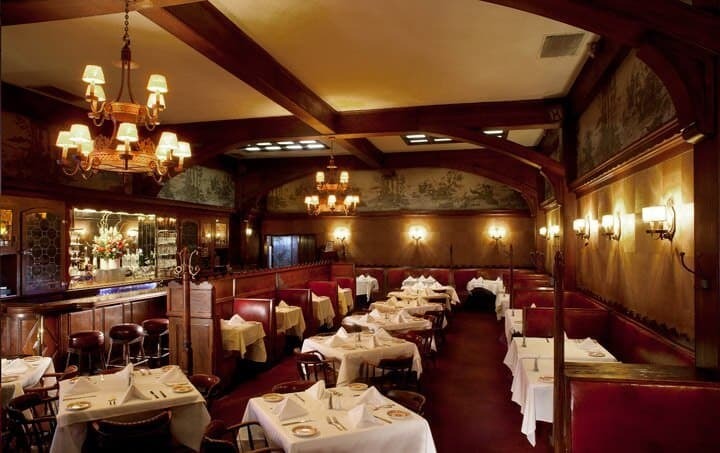 Despite its age and the amount of traffic The Musso & Frank Grill has received over the generations, we were amazed to learn that virtually the entire restaurant is still original. The restaurant has kept its red booths, high ceilings, and dark wood paneling. The waiters and bartenders still wear the same red coats they’ve worn for decades (well, not the “same” same red coats, but you know what I mean). And for the music selection that’s played in the background, it’s all the old wonderful standards. Also still original are the chairs, including the upholstery, the hat racks, air vents, lamps, and floors. It was fascinating walking around the restaurant and soaking in the history, imagining some of the things that had taken place there – the events, celebrations, the guests, the conversations – throughout so many generations of time. We were really struck by the dedication of the staff. Many of them have been serving at Musso & Frank for decades and some are multi-generation. The staff is like family and that’s readily apparent from the restaurant’s website which proudly features the staff, including pictures and quotes. Sergio, for example (below, second picture from left), came on board as a waiter in 1972 when he was 19 years old. He came to Los Angeles to visit his grandmother and was asked to temporarily fill in for his uncle who already worked there. He has worked there ever since: “My first and only job in my life.” Luis (below, to the right of Sergio), has been at Musso & Frank’s since 1957. You won’t get much in the way of saccharine smiles or small talk from the staff but you will witness a kind of dignity that is rarely seen anymore. 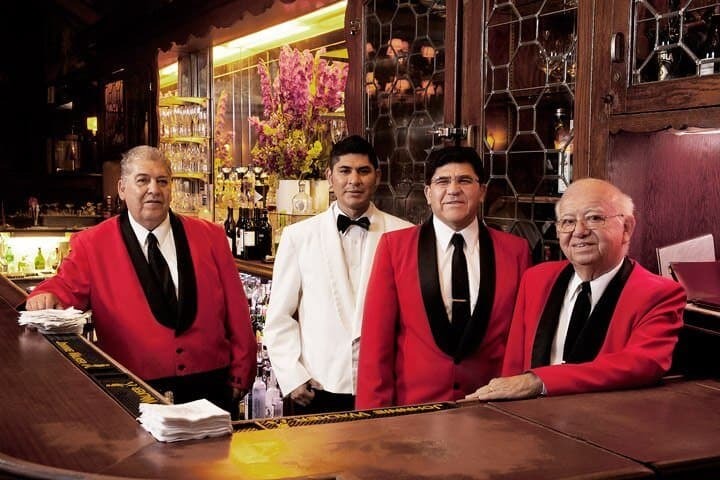 These gentlemen in their carefully pressed red bolero jackets reflect a time and tradition when the occupation of waiter was a stately and respected one. The Musso & Frank Grill was purchased by John Mosso in 1927 and today the restaurant is owned by the families of his three great granddaughters (below, left). Mark Echeverria (below, center) is the 4th generation general manager of Musso & Frank and John Mosso’s great grandson. We weren’t able to meet Mark in person but he was very kind and gracious through our email correspondences to facilitate this article. On the right is J.P. Amateau, executive chef of The Musso & Frank Grill. 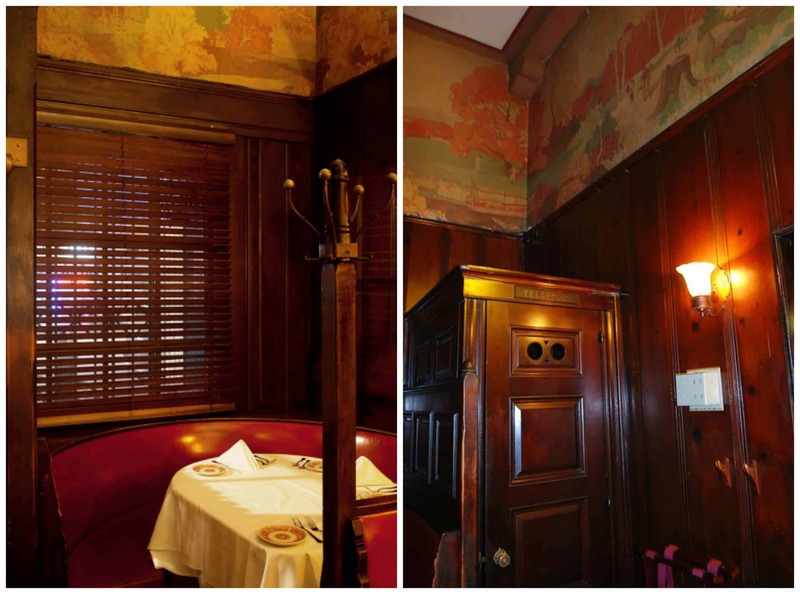 As a child, The Musso & Frank Grill was practically his home. His father Rod, was a Hollywood writer and director and a regular at the restaurant. Chef Amateau is a graduate of the Culinary Institute of America in New York, trained under famed chef Michael Roberts (Trump’s), later perfected his skills in France, and is only the third executive chef to have served at Musso & Frank’s since it’s opening in 1919. Let’s talk a little more about the food. Something else thoroughly fascinating about the restaurant is the “Grill” portion of its name. At the center of the restaurant is a massive grill that’s about as old as the restaurant. Steaks are seared on hot iron grates over an open fire on this historic grill that requires a special license to operate. You can sit and watch it in action. And back in the kitchen the cooks are busy whipping up their creations, everything from fresh pasta to their signature steak and seafood dishes. Here is something really interesting: A copy of Musso & Frank’s original menu from New Year’s Eve of 1939. How’s that for restaurant prices! 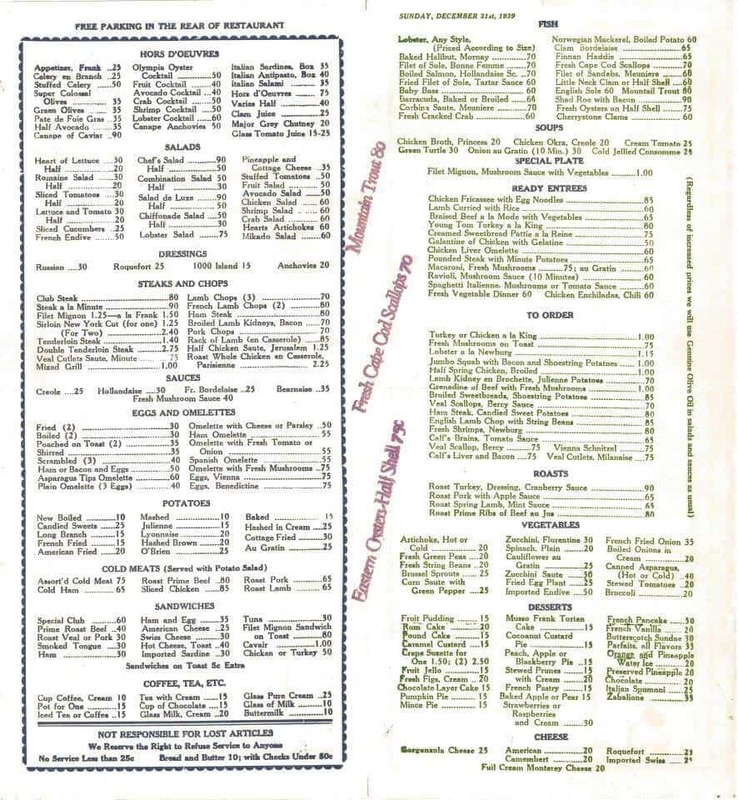 Though the prices have most certainly changed over time, the menu has not. In their words, “Our menu is so esteemed — so classic — it’s gone virtually unchanged for nearly 100 years.” You’ll find some unexpected classic dishes like Welsh Rarebit, Lobster Thermidor, and Grilled Lamb Kidneys with Bacon (Charlie Chaplin’s personal favorite). And you can also choose from their signature steaks, sandwiches, flannel cakes, seafood dishes, omelets and Italian entrees. One of their most beloved dishes, the Chicken Pot Pie, is only available Thursdays. The Veal Bolognese…divine. The depth of flavor in the sauce just seemed to keep going and going. The ground veal melts in your mouth and the savory mint-like quality of the fresh sage added a wonderful dimension of flavor. The fresh bucatini was fantastic. My husband and I have been talking about this dish ever since and look forward to a return visit to enjoy it again. For dessert we ordered the Raspberry Sherbet and decided to split a piece of cake. We narrowed down our choice between the Chocolate Mousse Cake and the Musso & Frank Torten. We asked our waiter, Alonso, to help us decide. In his deep accent and quick a wave of the hand he stated the obvious: “Chocolate is always good.” And so it was decided. It was the perfect ending to a fabulous meal. 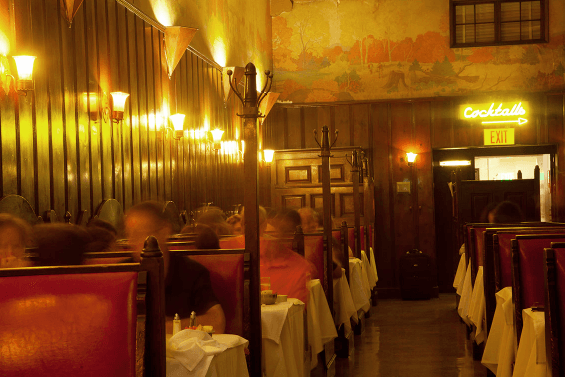 Our visit to The Musso & Frank Grill was truly a singular experience. It’s still remarkable to me that you can visit one time and leave feeling like you’ve been immersed in something rich and meaningful. Having shared a common dining experience with so many generations before, you leave feeling like it’s somehow part of you, and like you’re somehow part of it. With its rustic elegance and charm, its rich history and fabulous food, this restaurant holds a unique place in Hollywood history. And a trip to Hollywood simply isn’t complete without a visit to The Musso & Frank Grill. A warm “Thank You” to The Musso & Frank Grill for an unforgettable experience. * The Musso & Frank Grill has a strict no-camera policy. All images are courtesy of the restaurant and used with permission. That’s very kind of you, Brenda, thank you. Thanks for reading and have a wonderful time at Musso’s! LOVED this! But I’m mostly left feeling completely incredulous that I’ve been to Hollywood a gazillion times but have never been to Musso and Frank!! Seriously, how did I not know this gem existed??? Just goes to show there’s always more to learn and I learned about this right here on your blog, thank you! Thanks also for your wonderful recipes. Made the Moroccan Tagine a couple of weeks ago and everyone loved it! What an awesome place. I’m very sentimental too and knowing the background and history makes the dining experience even more wonderful. Thanks so much for another great review. It really does enhance the experience, P.L., and I always like to get as much background information as I can for that very reason. Thanks for reading! How cool is this! Going to LA over Christmas and will definitely be checking this place out. That’s great, Chris, enjoy your visit! I’ve been to The Musso and Frank Grill! I went there last year with my then-fiance. I remember thinking how interesting and historic it looked but I had no idea about all the interesting facts and the history behind it. I would love to go again now that I’ve learned so much about it. I’ll be looking out for all the things you pointed out and my husband will wonder how on earth I know so much about it :) Thanks for sharing! That’s awesome, Cami! And that’s great that you’ll have the opportunity to go back again. There are a few things that I didn’t know at the time either and learned about them after I got home and did some more probing through various magazine articles. We’re really looking forward to going back again as well to enjoy the food and take another tour. Have fun! What a neat looking place and very interesting history. Thank you for this article. You’re welcome and thanks for reading! I grew up in Santa Monica and lived in the Los Angeles area for a large part of my adult life, and have never been to Musso & Frank’s. It sounds wonderful. These days I stay as far from LA as I can, so it’s not likely I’ll ever get there. So I thank you for giving me the experience vicariously. Glad you enjoyed it so much. Susan, we’re definitely the “peaceful” and “serene” lifestyle kind of people and the LA metro isn’t a place we would want to live (and MAN the traffic is maddening! ), but it sure is a great destination for a fun getaway. Heading back down there with the kids next month (LA, San Diego and Santa Barbara – the latter our favorite town in southern CA). So happy you enjoyed it, BJ, thanks for reading! Beautiful article. The Musso & Frank Grill sounds wonderful and we’re really looking forward to trying it out in a few months when we go down for our annual visit. Thank you, Anita, have a wonderful time there and Bon Appetit! I’m embarrassed to say I’ve still never been! :( What a great post on a fabulous restaurant! Thanks to you, it’s on my list now!! Thanks, Kimberly! Thanks, Christina, and keep it high on that list of yours! I used to eat here often when I lived in L.A. One of the most interesting things to do there is to eat at the counter. I’ve had some fascinating conversations with total strangers and many people whose faces grace billboards. Somehow the counter at Musso’s is the great equalizer in Hollywood. I still go there everytime I’m in L.A. Great article! I would love to visit the oldest restaurant in Hollywood! LOVE that it’s still standing!! I know, Nikki, every one of the old great Hollywood restaurants has closed down over the years, but Musso’s has stood the test of time. Wow! What an incredible spot! I will definitely, definitely have to check it out my next trip to LA! I love old restaurants like this – like Tadich Grill in San Francisco – same old style service and food, and not much has changed on the interior. You had me at martini! You’ll love it, Andi! So much history and I love how virtually everything is still original – even the menu! A terrific “virtual tour” of this Hollywood landmark, and gorgeous photos, too. I’m working on a review of the 1939 movie, “Bachelor Mother”, with a particular focus on the food in the New Year’s Eve scenes. I would like to use your image of the Frank & Muso 1939 NYE menu, with a link to this post. Are you OK with that? If not, I understand. But if you are OK with it, shall I credit you as “The Daring Gourmet”? I’m a huge Ginger Rogers fan and Bachelor Mother has always been a favorite. That photo is used with permission from Musso & Frank’s so you’ll need to ask them for permission as well. All the best for your review.